SOS readers may recall that I attended Borders' RomCon in Denver over the summer. It afforded me to rub elbows my favorite historical authors - Cathy Maxwell (Navy Vet), Sally MacKenzie (sister of a Navy Vet), Julia Quinn (sister in law of a Marine), Anna Campbell (Aussie author), and many others. In celebration of the Navy’s birthday, Kim asked me, if I’d be willing to share a few ex-Navy wife memories. Absolutely! My years as a Navy wife, without a doubt, helped me grow into the woman I am today! At nineteen I married a wonderful young man who was in ROTC at the University of Colorado. When I say I totally had NO IDEA at the time what life had in store for me, it’s definitely an understatement! To corrupt what the old commercials used to say, it’s not just a marriage, it’s an adventure! The part I certainly DIDN’T like was hubby being gone so much. SO much! After six months of training split between Dam Neck, Virginia and Newport, Rhode Island [where I had my first bite of pizza! 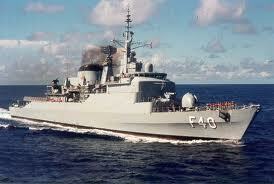 ], he reported to his ship, the USS Hermitage, a troop carrier. And carry troops it did. It began with a six-month Med cruise… and as all Navy families know, they might be billed as six months in the Mediterranean, but they’re never shorter than seven or months! Then there were Marines and Army Corps of Engineers to transport to Guatemala after horrible earthquakes devastated that country. A couple months home and he was off again, this time three months in the North Atlantic. On his return crossing, they learned that they had been tapped as a replacement and were headed back to another Med cruise within a month. That was it for me. I’d almost forgotten what hubby looked like! This time, we put everything we owned in storage and I bought a plane ticket and a Eurail Pass and, one month after his ship left, I headed off to France with two other Navy wives to be waiting with open arms when the ship docked. The adventure had begun. What’s that old saying about when men plan, God laughs? That goes for women, too. I am living proof. It was 1977. 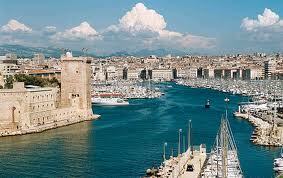 The ship was due to dock in Marseilles, France on May 24, which just happened to be our 3rd wedding anniversary. I couldn’t imagine anything more romantic. It was perfect. Until I realized that ‘strike’ everyone was talking about meant that the docks would be closed, no tugboats would be operating, and, most important to me, no ships would be docking. I spent my third anniversary standing on a pier, staring out into the ocean at the little gray dot on the horizon that was my husband’s ship. So close and yet, so far. Okay. I’ll be honest here and admit, there were more than a few rough moments during the four months I traveled. Some of them, downright scary. But they made for memories I treasure to this day, right along with all the wonderful experiences I had on that trip. There was the night my traveling companions and I were in Bologna, Italy. We’d walked to a restaurant for a late dinner – along with some rather potent house wine! – and ended up after midnight, wandering around the strangely empty city streets hunting for the tiny hotel where we stayed. When we finally found it, the owner carried on like she’d expected never to see us again. The next morning she explained that Bologna was under curfew and no one was allowed on the streets after 10 p.m. That explained the men in uniform following us home! It was the first time I ever heard that an individual city within a country could be Communist-controlled even when the country wasn’t. There was the wonderful party we wandered into in Venice, Italy. Once again, hunting for a restaurant, totally turned around on the little back alleyways, we found ourselves in what appeared to be a neighborhood picnic. It was absolutely wonderful! The people were so friendly and welcoming. When we explained we were simply hunting a place for dinner, they insisted we sit down and eat with them. After an absolutely fantastic meal, with music and dancing, we made our farewells and headed back to our B&B, all too aware of the giant sickle and hammer banner hanging over the plaza and knowing our husbands might not be too happy having to explain to their Captain why their wives had spent the evening at a Communist block party. There was the late night flight from Sicily, where they’d boarded us on the tarmac under armed guards. We landed in Genoa around midnight only to learn as everyone else climbed into waiting private cars, that the airport was closed until 6 a.m. Closed. As in no lights, no taxi service, no people. Oh… except for the Italian army guys patrolling the dark airport with their sub-machine guns! Scary guys with big guns, staring suspiciously at a couple of twenty-two year old Navy wives, sitting alone, huddled in a dark airport. Freaky. Until they started to talk to us, learned we were Americans, and wanted to tell us about all the relatives they had who lived in New York or Florida or California, and about how much they wanted to go to the United States to see it, too. There was the Mafia don I met in Sicily. Of course, that was after losing my husband’s ship in Naples when it didn’t show up and the Navy wouldn’t give me information on where it was. Out of money and out of options, I can only say Thank God for the USO and the chief petty officer I met there who, basically, saved our lives by encouraging us to go to Augusta Bay, Sicily, to find the ship. The stories go on and on. And so do the memories and the friendships I made in those days. I might have hated having my husband gone so much, but I treasure every one of the experiences. So, from a grateful ex-Navy wife… thank you and HAPPY BIRTHDAY to the Navy!! 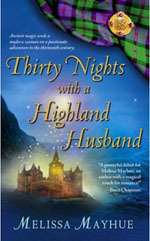 "Then came the summer we took our second family vacation to Scotland. 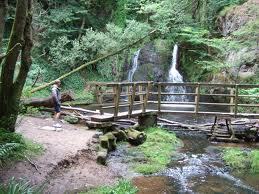 On the Black Isle [ which isn't black or even an isle ], near the pretty little town of Rosemarkie, we parked our rented car and hiked back into a magically beautiful placed called Fairy Glen. Resting on a large rock at the edge of a waterfall and pool, lulled by the lush nature of the setting, I suddenly realized THIS was the place for Cate and Connor. 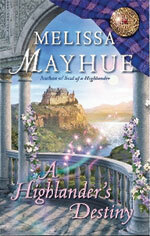 For the remainder of that trip, I'd catch glimpses of them, in a castle, standing at the foot of a crumbling staircase, or riding through a highland meadow." 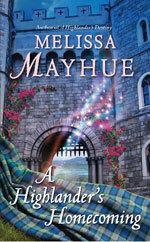 Melissa's books are set in the late 1200's - a time when Scotland was focused on its land battle against England during the Wars of Independence. Scotland would not turn its attention to a full scale Navy until James I sought to protect the shipping interests of his country in 1424. 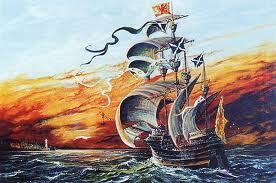 In 1506, James IV launched the Scottish Navy's greatest achievement - the Great Michael. She was the largest warship in Europe — twice the size of her English contemporary Mary Rose. The Great Michael is also famous for carrying Mons Meg, the great cannon used earlier in the siege of Threave Castle. Ultimately, the Great Michael was too costly to maintain and the king sold her to France (where it may have been renamed and helped sink the Mary Rose). 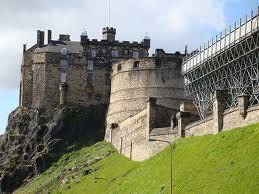 But Mons Meg now resides in Edinburgh Castle. 1. Contact Kelly at Columbussos@gmail.com to join Operation Holiday Card. It is our goal to ensure that 1000 deployed airmen, marines, sailors, soldiers, and Coast Guardsmen receive a holiday card. 2. Leave a comment about Melissa, the USO, and/or trekking across Europe. 3. Make sure I know how to contact you - send your email to sos.america@yahoo.com or friend SOS America at Facebook. This giveaway is only open to US residents. But I will send a Navy treat to any reader who sends his/her mailing address to sos.america@yahoo.com. 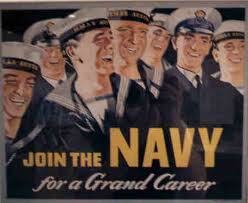 And join us tomorrow for the conclusion of Fleet Week! Next fall, they are performing in Brisbane, Australia, for the Pan Pacific Convention 2011, http://www.panpac2011.org.au/. 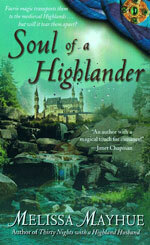 I will also look for three historical authors who rock - Anne Gracie, Anna Campbell, and Christine Wells. 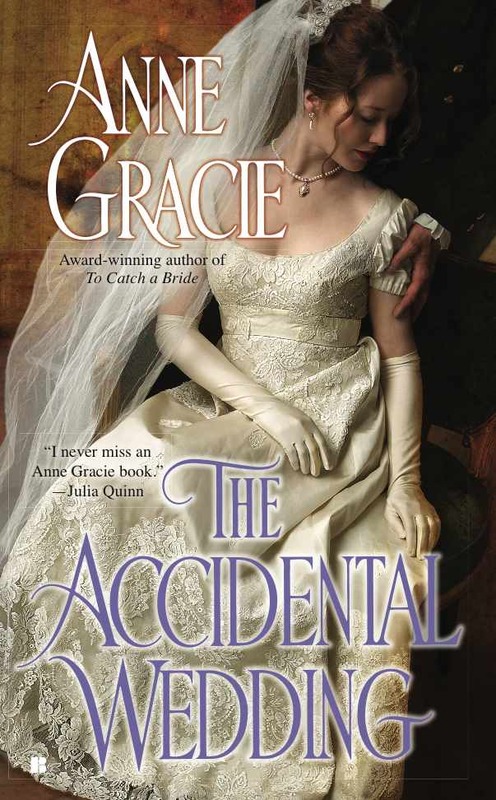 Last summer, I had the distinct pleasure of meeting Anne Gracie after the RWA National Convention in Washington, DC. She stayed a few extra days in the US with Mary Jo Putney. I joined them for lunch in Baltimore just before I moved to Hawaii. I was star struck by these two members of the Word Wenches, http://www.wordwenches.com/. But they were so warm, generous, and charming. Anne even laughed at a few of my "Lucy" moments as I traveled around Europe in the military. She commented that I was a story teller and encouraged me to write. This summer, I met Anna Campbell at RomCon in Denver, Colorado. We exchanged emails before the convention as I wanted to interview her for this blog. As my plane descended through turbulence into Denver, I kept saying to myself, "If Anna Campbell can fly all the way from Australia, I can survive this." And I did. And I was rewarded with a big hug, jolly laugh, and a new friend in Anna. 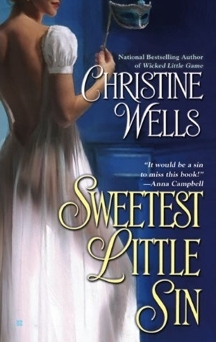 I missed the opportunity to meet Christine Wells at the RWA National Convention in Orlando, Florida. 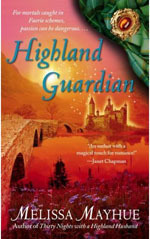 But I feel as though we are already friends - I follow both Christine, Anna, and the other authors in the Lair at Romance Bandits, http://www.romancebandits.blogspot.com/. 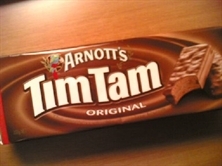 The Romance Bandits frequently chat about Tim Tams, putting me in an Australia frame of mind. So I invited Anne, Anna, and Christine to an interview about Australia. Grab a box of Tim Tams and join me for a chin wag with my Aussie friends. * This is my overactive imagination at work. Kim: What part of the continent do you live? Alex: I was born in Canberra, grew up in Sydney, but I now live in Hawaii. Anne: I live in the southeast corner, in Melbourne, the second biggest city in Australia. 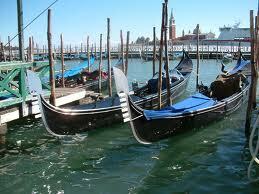 It's very civilized, a "foodie" place and currently ranks as the third "most livable city" in the world. 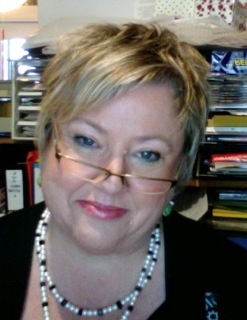 Anna: I live on the beautiful Sunshine Coast, a resort area about an hour north of Brisbane in subtropical Queensland. Christine: I live in Brisbane, about half way down the east coast of Australia, within an hour's drive to the best beaches in the world. Not that I'm biased or anything! Kim: If you could showcase one aspect of Australia, what would it be? 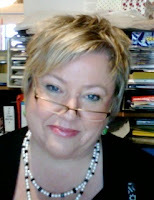 Alex: The Romance Writers of Australia, http://www.romanceaustralia.com/. Its members are creative, talented, and beautiful. I am available to be their cover model on future releases. Anne: The Great Barrier Reef — it's stunning. Anna: The wildlife. Even in quite built-up areas, the birdlife is amazing. 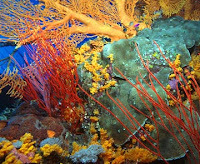 Christine: I think the Great Barrier Reef is something everyone who comes to Australia should see. Other than that, we have spectacular seafood. Try our Moreton Bay Bugs, which are like mini lobsters but tastier (IMO!) We have beautiful wines, too, so if you like a glass or two, make sure you sample some of ours. Oh, and stock up on Cadbury's chocolate while you're here! Kim: What is your favorite movie and/or book set in Australia (historical or contemporary, real or fiction)? Alex: The Incredible Journey of Mary Bryant. I played the husband of the title character, a woman who was among the first of the British convicts sentenced to Australia in the late 1700s. This part garnered two nominations for Best Actor - Australia Film Institute Award in 2005 and Logie in 2006. Anne: Probably Crocodile Dundee — when it comes on TV repeated for the hundredth time, it still gives me a laugh. As for favorite Australian book, (it's also a movie) I'm fond of My Brilliant Career (Miles Franklin) but my childhood heart was firmly captured by the illustrations from Snugglepot and Cuddlepie, the gumnut babies. Christine: I think it would have to be My Brilliant Career or Picnic at Hanging Rock--both books and movies. They're classics and I think Judy Davis (MBC) is a brilliant actor. For more modern movies, Strictly Ballroom and The Castle. Kim: Do you prefer rugby, football, or soccer? Alex: I prefer surfing, which is popular in both Australia and Hawaii. having already begun a lifetime's barracking. Anna: Not really a football fan - sorry! Kim: What is the correct way to eat Tim Tams? Anne: There is no correct way. Tim Tams are a delight to be enjoyed in a variety of ways. Some like to do the Tim Tam Slam (drinking coffee or hot chocolate through them like a straw.) Not me. I like them crunchy and cold from the fridge. Anna: I like to eat the classic Tim Tams (milk chocolate) the classic way - just grabbing a packet and making a pig of myself! Christine: With a cup of strong, hot coffee. Warning: You can never stop at just one Tim Tam! For an occasional treat, try the Tim Tam slam, but honestly, room temperature Tim Tams are the way to go. Some people like them after they've been refrigerated, though, so the chocolate isn't so gooey. ** Overactive imagination is now in overdrive. 2. Make sure I know how to contact you - if I do not have your email address, please send it to sos.america@yahoo.com. Or friend SOS America on Facebook. 3. Comments will be accepted through Friday, October 8. This giveaway is open to US residents only. Join us tomorrow as we celebrate Janet Mullany's newest release, Jane and the Damned.